On 27 January 2016, Al-Bawaba news published names of 30 Muslim brotherhood elements, who joined terrorist camps in Libya and are trained to commit suicidal attacks in Egypt. Al-Bawaba news revealed 30 names out of 100 from the Muslim brotherhood organization, who joined terrorist camps in Libya and Syria, especially the terrorist group called “Al-Morabetoun Al-Godod” a terrorist branch of Al-Qaeda organization in Libya, to prepare the MB elements to carry out suicidal attacks in Egypt. The reports of the security services in Egypt revealed that these MB elements have joined the terrorist organizations in eastern Libya, to receive training among other armed militias. The Security sources mentioned that Salah Mohamed Ashraf, a 38 years old Egyptian Muslim brotherhood member from Al-Mansoura city, traveled to Libya since one year and a half, is the person in charge of recruiting MB youth to join terrorist groups including financing and training them in Libya. 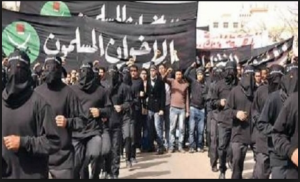 Muslim Brotherhood joined ISIS and Al-Qaeda terrorist camps in Eastern Libya, during the last 6 month and are trained on using weapons, making explosives and car bombs. The same security sources revealed that Muslim Brotherhood managed to recruit these youth by establishing faked imports, exports and travelling companies under the cover of helping youth to travel abroad, while the purpose was to recruit them and get them into the Syrian and Libyan territories to join the most dangerous terrorist organizations in these countries, to commit suicidal and terror attacks in Egypt. The security sources confirmed that the recruited Muslim Brotherhood youth are receiving 150 to 250 US$ per day in the terrorist camps in Libya. Among them some MB youth who studied in the engineering faculty of Al-Azhar university in Egypt, and others who participated in the MB Rabaa armed sit-in and also in the armed demonstrations of MB in areas like Haram, Mataryia in Egypt during the last period. The security sources said that the terrorist camps in eastern Libya like in Misrata and Derna areas, the camps include hospitals field, in addition to training camps and foreign elements from different nationalities led by Egyptians, Syrians and Iraqis. The leader of these terrorist camps is an Egyptian called “Abu Taha“, he graduated from Al-Azhar university in 2009, and he traveled to Syria then to Libya in 2012, and he established a school to teach the explosive industry in the City of Derna in Libya and his assistant is a Muslim Brotherhood too. The Egyptian security services revealed a list of 30 Muslim Brotherhood elements, and put them on the lists of high-risk terrorist elements and on the watch lists of seaports, airports, borders crossing. In addition to the publication and distribution of their names on all borders crossing of different security services. The security sources confirmed the tighten of security measures on the eastern borders of Sinai. Ahmed Owais Amr – from Al-Sharqia city -29 years old. (participated in MB Rabaa armed sit-in in 2013). Tariq Abd El-Majeed – from Al-Sharqia city -32 years old (participated in MB Ramses violence events in 2013). Sayed Ahmed – from Cairo – 27 years old (participated in MB Rabaa armed sit-in in 2013). Ahmed Abdulrahman – from Cairo – 29 years old. Aly Ahmed Tariq – from North Sinai – 30 years old (joined Ansar beit Al-Makdes group “ISIS branch in Sinai”). Abu Amr- from Mansoura city – 33 years old (participated in MB Rabaa armed sit-in in 2013). Ahmed Diaa Saad – from Cairo city – 34 years old. Amr Ahmed Shaheen – from Behera city- 33 years (participated in MB Rabaa armed sit-in in 2013). Shady Ahmed Tariq – from North Sinai – 31 years old. Raafat Ahmed Anwar – from Alexandria city – 29 years old. Noor Ahmed Afifi – from Cairo – 33 years old. Abu Talal – from Cairo – 36 years old. Abdul Rehim Anwar – from Cairo – 26 years old (participated in MB Rabaa armed sit-in in 2013). Al-Sayed Ahmed Hashim – from Salloum city – 29 years old. Atef Shaaban Radi – from Cairo – 33 years old. Ahmed Mahmoud Raouf – from Cairo – 26 years old. Ramadan Farouk Al-Sayed – from Cairo – 24 years old. Rizk Ahmed Aly – from Cairo – 33 years old. Farag Al-Sayed Taha – from Cairo 34 years old. Aly Ahmed El-Sayed Aly – 36 years old. Akram Mashhour- from Alexandria city – 30 years old. Faisal Tariq – from Cairo – 31 years old. Mamdouh Ahmed Hendawy – from Behera city – 33 years old. Mohamed Darwish Saad – from Giza – 28 years old. Metwally Arif from Cairo – 39 years old. Yasser Ashraf – from Damietta – 26 years old. Said Abu Al-Fedaa – from Behera city – 33 years old. Hashim Qutb Sayyid Qutb – from Cairo – 32 years old. Mahmoud Ahmed Amer – from Damietta – 36 years old. Walid Ismail Al-Sayed Maarouf – from Cairo – 29 years old.